The wonderful thing about visual journalism is it preserves real evidence that can be evaluated. 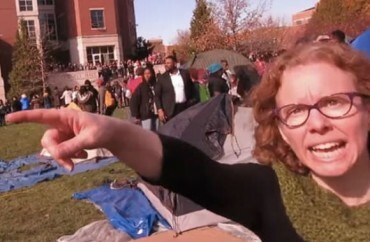 The video shot by University of Missouri student Mark Schierbecker, staff photographer for The Maneater, on the periphery of the “safe space” melee at Mizzou, is being used as evidence against Greek Life Director Janna Basler, now on administrative leave, and Melissa Click, the communications professor who lost her “courtesy appointment” in Mizzou’s acclaimed journalism school. On Wednesday night, Schierbecker said he filed a “municipal simple assault” complaint against Click with the MU Police Department. He claims she physically and verbally assaulted him. Schierbecker said he was accompanied by Danielle Muscato — his publicist and the former public relations director for American Atheists — and Ian Paris, the president of the MU chapter of Young Americans for Liberty. Schierbecker said he was not allowed to record his conversation with Click and said Paris waited outside Click’s door. An even higher-ranking professor has also been identified from Schierbecker’s video, Department of Religious Studies Chair Chip Callahan, who also tried to stop student and ESPN freelancer Tim Tai from taking photos of protesters. Meanwhile, a former associate dean of the J-school, Brian Brooks, “filed formal complaints against Basler and Click with the Title IX office at MU” because as a part-time employee he’s a “mandated reporter” for possible incidents, the Missourian continues. Brooks said he’d seen the video several times and said he considered Basler to have committed assault and battery against Tai, and Click to have verbally assaulted Schierbecker. He said the case could be made that because Tai was pushed, battery occurred. Basler and Click “tried to incite a riot,” said Brooks, who called the issue personal to him because he recruited Tai to Mizzou.